I need this functionality on my project and it was the last date of delivery, i got this solution and able to deliver the project. Is it also possible to select only one of the items in my database and zoomed in? So I get only one result, with multiple results it works… How do I get it to work with only one address?? Great post. I was able to easily follow and I can’t code. 1. If only one column is showing, find the WebPartPages:XsltListViewWebPart section. 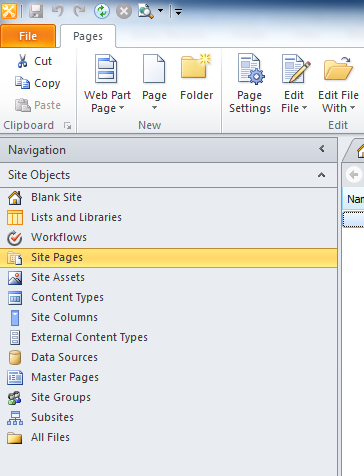 Then click Add/Remove Columns from the Code View Tools section at the top of the SharePoint Designer toolbar. This will allow you to add the address field in case you were getting the following error: “geocode was not successful for the following reason zero_results”. -Directions from one location to another. 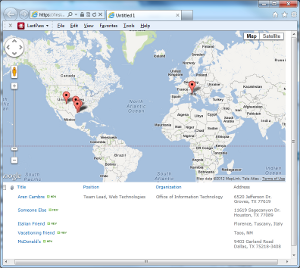 -Number or letter labels associating the points on the map with the locations from the list. Whoops, I removed that API key and replaced it with API_KEY_GOES_HERE. Thanks for pointing that out. I don’t have answers to your question, unfortunately. I built this for a technology demo and haven’t pushed it any further. This is great! I have requirement that needs to calculate the distance between 2 addresses within a SP 2010 foundation list. How can I accomplish this? Can you export these geocoded addresses into an Address Locator file? What is an “Address Locator file”? I know it has been awhile since you posted this article… but could you giv an example of where you placed the on the sharepoint aspx page in designer. Sorry, like you said, it’s been too long! We didn’t end up using this code in production. Next Next post: Is Flying Colors Sports’s Great Amazing Race a scam?